Marketing is evolving continuously with each passing day. In order to dominate the WWW and get more business opportunities, entrepreneurs and website owners use different types of marketing tricks, such as inbound marketing, content marketing, Agile marketing, email marketing, event marketing, experiential marketing, results marketing, account-based marketing, affiliate marketing, etc. As inbound marketing and content marketing play an important role in SEO, these two are widely used by most of the digital marketing professionals to achieve the set target. A good command over these two can help SEO noobs to meet their main objectives easily and quickly. Are you fully informed about these two? If not, then let’s know how they work. In simple words, Inbound marketing is a set of tools, technologies, and processes that work jointly to drive traffic to your site and convert them into leads and sales. In other words, inbound marketing is the way to make money through websites/blogs by selling your products and services online. Content marketing is a process of creating and distributing valuable, relevant, and consistent content, publish them on different web platforms to attract the targeted audience and encourage them to be a part of the lead generation process. Anyone in the web-based business who is sanguine about dominating the WWW needs to adopt the content marketing sooner or later. Digital marketing professionals use different inbound marketing tactics to meet their specific goals, such as SEO, Blogging, Social Media, Live Events, Webinars, etc. All these activities can help you to generate social media shares and inbound links, increase brand awareness, encourage customers to engage with your brand whenever they need, fuel search engine optimization efforts, and generate qualified leads in less investment. These days, it is mainly done on WWW. Nevertheless, It can also be performed in print and in person too. It helps you to make your website “a hub” for the targeted audience and generate traffic through different search engines, blogs, and social media. The availability of quality content is an important to perform different activities of the inbound marketing program. Therefore, it is said that content marketing and a traditional outbound marketing program go hand to hand. A complete content marketing strategy always includes inbound marketing principles. But, digital marketing experts, use more holistic approach to meet the specific goals of web-based businesses. SEO, email marketing, lead generation, blogging, social media, lead nurturing, and analytics. Planning, the creation of SEO optimized and quality content, optimization, and following different metrics to boost the consumption of the content as far as possible. Can Inbound Marketing and Content Marketing Work Together? To perform different activities of inbound marketing, you need an uninterrupted supply of quality content which is possible only with content marketing. 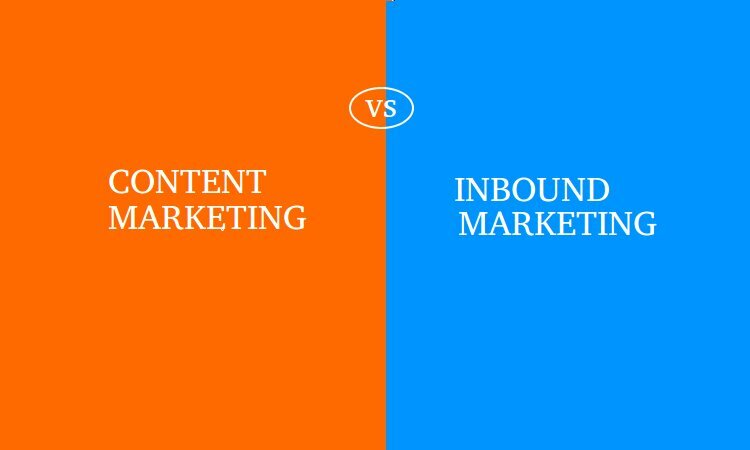 So, both content marketing and inbound marketing work together as components in most of the cases. Different types of content are used in inbound marketing to drive results. Therefore, SEO executives always focus on content optimization for search engines/humans and improving the conversion rate. Do You Need To Use Both Of Them To Achieve Your Objectives? To be honest, different SEO professionals use different strategies and tricks to meet the end goal of their business objectives. So, it is unfair to predict which one is best-suited for your needs. In general, despite implementing content marketing, almost 70% of marketers say that their strategy is ineffective and basically useless if they don’t use content marketing and inbound marketing together. For example- if you want to run a Professional WordPress site, you may require to hire someone who can properly design and optimize your site, send newsletters to subscribers regularly, perform SMO, and monitor the performance of the site at all the times without any fail. Every lead generated as a result of your SEO exercise includes some content. So, you need both content marketing and inbound marketing to fulfill your business goals easily within a short duration of time. How To Initiate Your Inbound Marketing/ Content Marketing? Create an inbounding marketing calendar and execute it strictly. Optimize your content for search engines/targeted audience and meet your end goals. Content marketing and inbound marketing go hand-to-hand. You need these two to meet the ultimate objectives of your Web-based business easily and effortlessly. Previous Previous post: How to apply for Aadhar card? Nice blog. As content & inbound if done together, then strategy will work for sure. Thanks for sharing some good suggestion for content marketing & inbound marketing. It was helpful blog.